Michelin Clio Cup Series podium regular returns to Race Series action aiming for championship glory. Pitbull Racing driver set for extensive winter testing with newly-acquired 2017-18 title-winning car from Ben Palmer. New season set to begin at Silverstone – the ‘Home of British Motorsport’ over the weekend of 30th-31st March 2019. 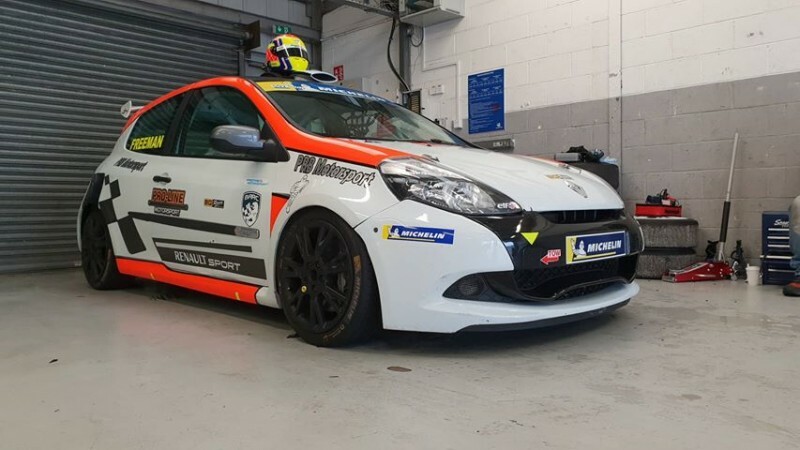 Michelin Clio Cup Series podium regular Simon Freeman is aiming for championship glory after confirming his return to the Race Series for the 2019 season. Silverware has been the theme of Freeman’s time at the wheel of a 2.0-litre, third-generation RS Clio 200 since his debut in the championship at Croft in 2017, with a remarkable 16 podium finishes from a possible 26 starts to date. He narrowly missed out on the Vice-Champion honours last season but is now looking to go one better and carry forward the experience into a fully-fledged title assault in 2019 with the backing of long-term sponsors Freeman & Hook Bricklaying Ltd. The team has also been boosted during the off-season after purchasing Ben Palmer’s double title-winning car as the latter moves to the MINI Challenge, giving Freeman the best tools yet to fight for the crown. The Pitbull Racing driver will now seek to get valuable winter testing mileage behind him as the series gears up for an action-packed opener at Silverstone International over the last weekend of March. Beyond that, the seven-event calendar will once again take in a host of the UK’s most challenging venues - and a first overseas trip to Zandvoort in the Summer – before concluding at Oulton Park in October. “There’s only one objective on my mind heading into the new season and that’s winning the Michelin Clio Cup Series title,” commented Freeman. “With a new, championship-winning car at Pitbull Racing, everything is in place for a successful season and we’ve proven repeatedly since entering the series that we’re more than capable of racing at the sharp end with the best. “Winter testing is a valuable addition to our programme and that should hopefully put us in a very strong position heading to the season opener at Silverstone. It’s a tough series to win, but I’ve never been in a better place to try and bring home the title. I can’t wait to get the season underway.